← AKAI MPC Expansions at an incredible 50% Off today ! On the 6th of February 2019 Nugen Audio will be present at the GRAMMYs in the Producers and Engineers wing. To celebrate this occasion, they are offering the Modern Mastering Bundle at $100 off! 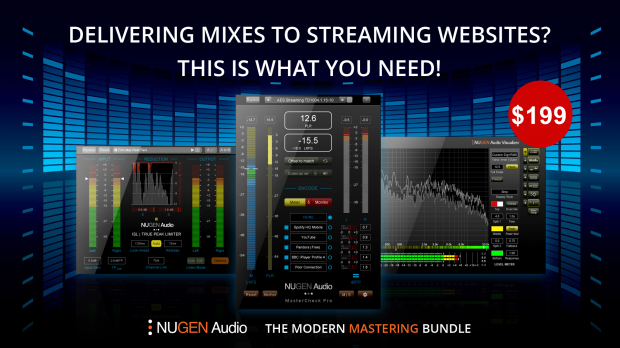 Get the Modern Mastering Bundle Here for only $199! These award winning plug-ins are designed to allow you to master effortlessly, with confidence and precision. Modern Mastering delivers ground breaking functionality – streaming service auditioning, pristine limiting and a full suite of audio analysis tools & play-out delivery measures – all built with a level of usability not available anywhere else. Let ISL take care of your mastering for today’s music delivery services (Apple Music, Spotify, Tidal etc.) The risk of distortion from down-stream codec conversion (mp3, AAC etc.) is eliminated with ISL on the master bus. This entry was posted in DontCrack, Plug-ins, Promotions and tagged codec conversion, ISL ST, loudness matching, MasterCheck Pro, Modern Mastering bundle, music delivery services, Nugen, NUGEN Audio, Visualizer. Bookmark the permalink.